ANKARA, Aug 28 (Reuters) - Tayyip Erdogan was sworn in as Turkey's 12th president on Thursday, cementing his position as its most powerful leader of recent times, in what his opponents fear heralds an increasingly authoritarian rule. Reading the oath of office in a ceremony in parliament, Erdogan vowed to protect Turkey's independence and integrity, to abide by the constitution and by the principles of Mustafa Kemal Ataturk, founder of the modern secular republic. "In my capacity as President of the Republic, I swear upon my honor and repute before the great Turkish nation and before history to safeguard the existence and independence of the state," he said at the brief ceremony. He was then seen off by military salute as he left to lay a wreath at Ataturk's mausoleum which lies on a hill in the heart of Ankara and is one of the most important symbols of the secular republic. This was to be followed by another ceremony at the presidential palace. Moments after being sworn in, Erdogan appointed outgoing foreign minister as acting prime minister, according to an announcement in the official gazette. Davutoglu will oversee the existing cabinet until Erdogan asks him to form a new government, expected to be announced on Friday. 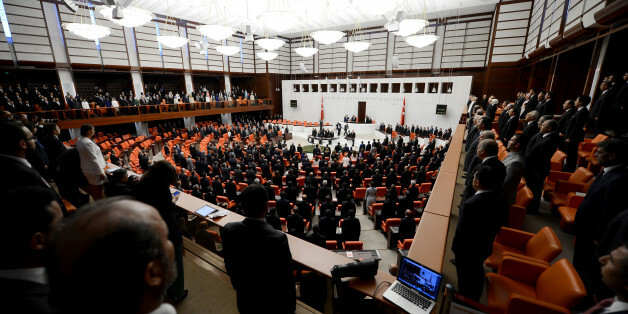 Members of parliament from Turkey's main opposition CHP walked out moments before Erdogan took his oath, while party leader Kemal Kilicdaroglu boycotted the event entirely, accusing Erdogan of breaching the constitution by remaining in office as prime minister after his presidential victory. "We're now more worried than ever about one-man, autocratic rule in Turkey," CHP deputy Aykan Erdemir told Reuters. Erdogan's victory in Turkey's first popular presidential election this month capped more than decade as prime minister in which the economy has tripled in dollar terms and the country has carved out a growing, though often controversial, role in the politics of the conflict-torn Middle East. Opponents warn his ambition to establish an executive presidential system will concentrate too much power in the hands of a leader with autocratic instincts and lead the EU candidate country ever further from the secular ideals of Ataturk. Senior representatives of some 90 countries from Asia, Africa, the Middle East and Europe will attend ceremonies later on Thursday, including the emir of Qatar and Iran's foreign minister, Erdogan's office said, although no major Western heads of state are expected. Ukrainian President Petro Poroshenko had been due to attend but canceled after accusing Russia of bringing troops into the southeast of the country in support of pro-Moscow separatist rebels.